In today’s BraveIT Sponsor Spotlight, Cemtrex announces a new product for IT staff and engineers who need a powerful, smart workstation without the distraction and mess of wires. We do far too much work just trying to do our actual work. Squinting at a small screen. Shuffling papers on the desktop. Moving across the office to scan and send. Losing connectivity. Finding connectivity. Losing it again. We carry powerful smartphones in our pockets. Our cars are connected. And our homes are smart. It was time to bring the office into the modern age. So, we completely reimagined the computer and desk and how we interact with it. We designed a workstation that works smarter, so you don’t have to work harder. We’re reintroducing the workstation. 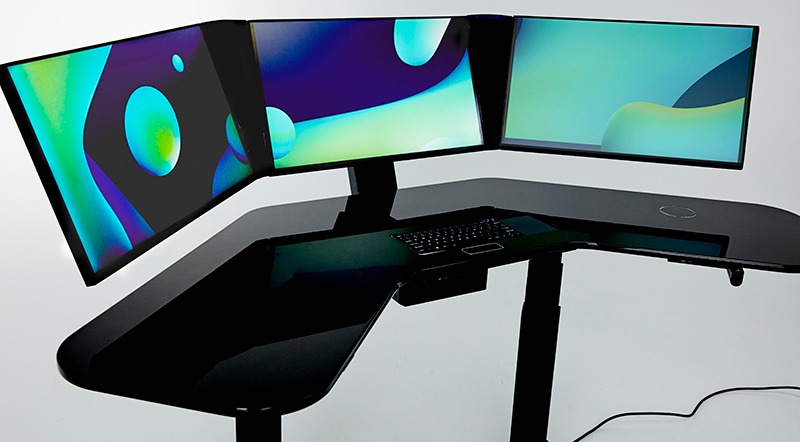 This is the Cemtrex SmartDesk. The Cemtrex SmartDesk is the most advanced workstation. A seamless blend of design and performance in a sit/stand desk, connected with just a single wire. We removed all the cables, clutter and struggles. We combined all the tools and tech from our smartphones, tablets and gadgets. At the heart of the SmartDesk is a powerful computer that supports the most demanding software and tasks, from engineering to architecture and finance. There’s more screen space with three large displays, providing 72-inches of touchscreen that your fingers, cursors and windows can seamlessly move across. We also integrated a document scanner, digital phone, wireless smartphone charger – all the modern tech and needs built in. But the SmartDesk isn’t just hardware. The software is what lets you take control like never before. We’ve built powerful software that gives you control of your office and cell phones right from the SmartDesk. Say goodbye to your bulky old desk phone. We’ve also introduced our STARK Gesture System, giving you a groundbreaking way to interact with your workflows. Turn pages with the wave of a hand. Zoom, scroll, copy, paste – all without ever touching a thing. There’s also touch gestures to streamline your workflows. A few simple taps will manage your windows and make multitasking a breeze. We reconsidered it all, every task and tool, and solved it with modern technology and seamless design. We left out the struggles and the clutter. We redesigned your workstation to be more intuitive, more adaptable, simpler and smarter. This is the new way we work. This is the Cemtrex SmartDesk. BraveIT is an interactive, thought leadership and networking event designed for the modern IT professional. Tech leaders and IT Peers will host sessions with insights on how to best navigate issues with data security, data storage, and disaster recovery, as well as a glimpse into new technologies, regulations, and user trends that affect IT organizations. The event takes place on September 13, 2018 in Chicago, IL. Learn more and register today.